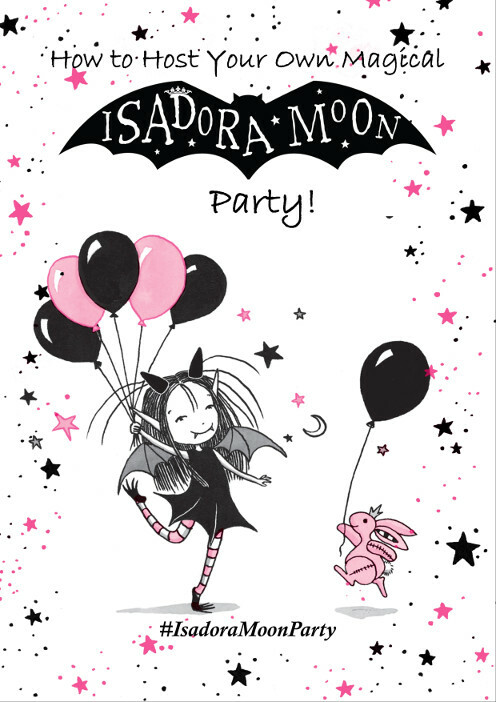 A few weeks ago, my editor Claire at Oxford University Press said that someone she knew had organised an Isadora Moon party. 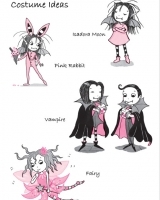 She suggested that putting together a guide on how to hold your own Isadora Moon party could be fun. 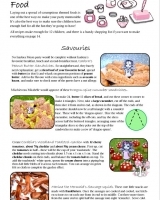 At the time, I was in the middle of working on Isadora Moon Goes on a School Trip, and I’d recently had Celestine, so putting an Isadora Moon party pack together was not something I had any spare time for. However, since starting to work with me full time, Henry has been busy creating one! It’s not quite finished yet, but it’s nearly there. 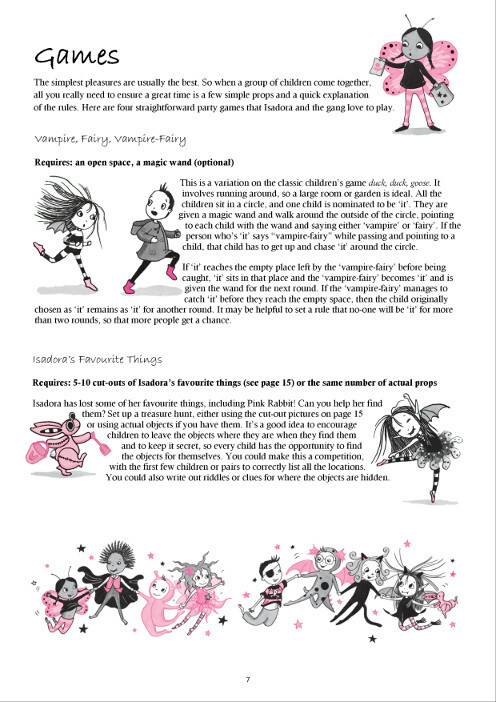 It’s going to include recipes, costume ideas, tips for decorating, and different Isadora Moon party games. This week, Henry has mainly been working on testing out the recipes and doing the layout of the pack. Clockwise from top-left: frying Marina the Mermaid’s Frankfurter Squids; Cutting watermelon stars for the magic wands; Isadora’s Bat Oreo Truffles; Vampire fairy cakes with jammy centre. It took him two afternoons to do all the shopping for the recipes and then test them out, but I think the results are looking really good. He also adapted the recipes himself. What I like about them is that they’re all home-made – not just putting ready made things together. They’re also on the healthier side for party food, which is always a bonus. 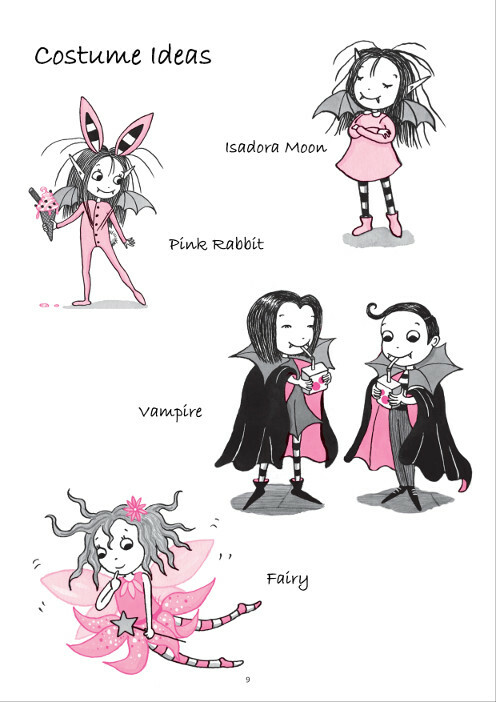 Even if someone hosting an Isadora Moon party doesn’t want to use all of them, they can at least get ideas and use some of the recipes. Pink Rabbit would be excited about the prospect of carrot and pea pies… even though he only pretends to eat. He borrowed the use of my mum’s kitchen for most of the cooking, as it’s bigger than ours and has better lighting. Once he had finished the preparations, it was time for me to come over and photograph it all. I can really see how entire careers are built on photographing food professionally: it’s a real challenge. It was worth it though, as after I was done, we got to sit down and taste it all. The sticky sushi rice ghosts filled with tuna mayo were my favourite. In honour of Oscar the Ghost in ‘Isadora Moon Goes on a School Trip’, Henry made these sushi rice ghost bites. I also really liked these little tomato and cheese toadstool nibbles. They looked great when I photographed them, although a few of them fell over when I moved the tray. 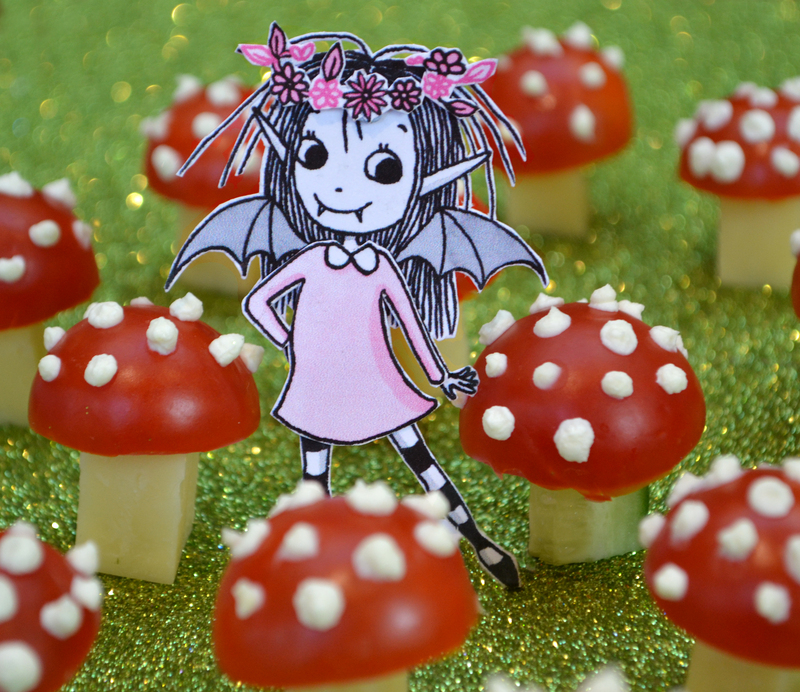 These tomato and cheese toadstools made for tasty nibbles and a magical setting for Isadora to strike a pose. 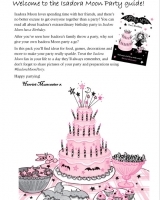 So how can you get your hands on the Isadora Moon Party Pack, I hear you ask. 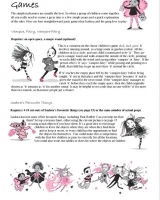 Henry’s plan is to launch it alongside the new Isadora Moon / Harriet Muncaster newsletter, which will start going out roughly monthly from the end of August. The idea is that you can subscribe to receive Isadora Moon news, activities and resources straight to your email inbox each month. As a ‘thank you’ for subscribing, you’re then sent a link to download the party pack. 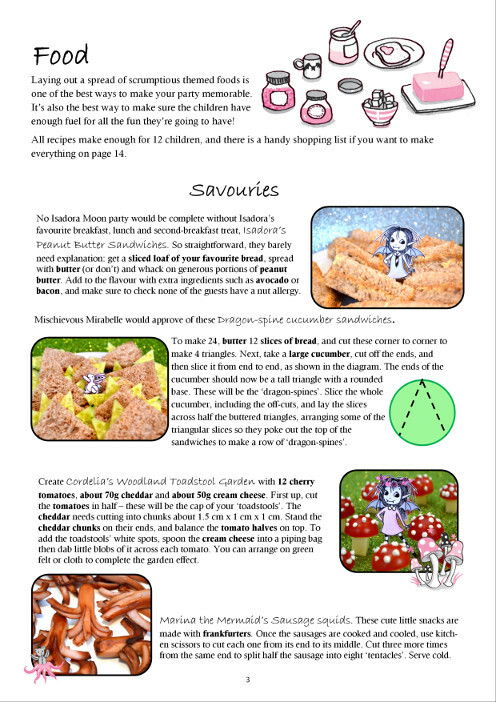 Even if you don’t want to do a fully party, there are still some fun recipes to try in there, as well as ideas for games children can play with a group of friends. (Click each image to see a larger version, and then use arrow keys or the onscreen arrows to move between them). 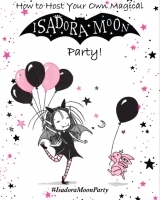 If you are inspired to hold your own Isadora Moon party, I’d love to hear about it. You can share it on social media using the hashtag #IsadoraMoonParty. In the meantime, here’s a picture of me enjoying the fruits (literally!) of Henry’s labours. On the right you can see Henry in his ‘official work uniform’ with some of the food he prepared. 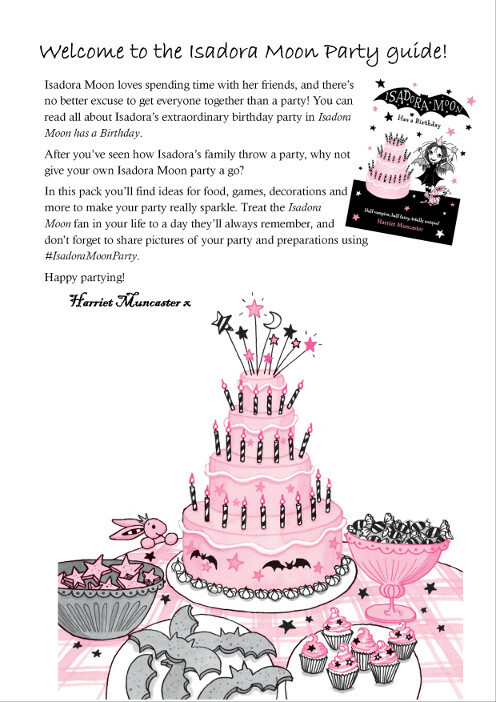 You can read all about the party Isadora Moon hosts in Isadora Moon has a Birthday, available from Amazon and all good bookshops.